New Delhi, Oct 25 (IANS) India and the US have agreed that Pakistan should immediately take steps to finish the terror organisations and terrorist safe havens on its soil, External Affairs Minister Sushma Swaraj said on Wednesday after her meeting with visiting US Secretary of State Rex Tillerson. 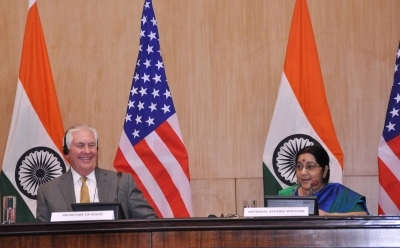 Speaking at a joint press conference with Tillerson, the External Affairs Minister said both India and the US have agreed that President Donald Trump’s new Afghanistan policy would be effective only if Pakistan takes action against terror groups on its soil. The Minister said that both India and US have agreed that it is important to ensure that no country is a safe haven for terrorists. “The nations that support terrorists or support them should be held accountable. We also agreed that Pakistan should take steps immediately to finish the safe havens for terror organisations that are there on its soil. We believe President Trump’s new policy can be successful only when Pakistan indiscriminately acts against all terror groups,” she said. During his Islamabad visit on Tuesday, Tillerson told Pakistan that it must increase its efforts to eradicate militants and terrorists operating within the country.